Islamabad, March 19: Pakistan Supreme Court on Tuesday adjourned the hearing on bail plea of former Prime Minister Nawaz Sharif on medical grounds till March 26. Sharif is currently serving seven-year jail term in connection with Al-Azizia graft case. The three-member bench of Supreme Court headed by Chief Justice Asif Saeed Khosa also issued a notice to the National Accountability Bureau (NAB) to submit a reply in the matter during the next hearing. 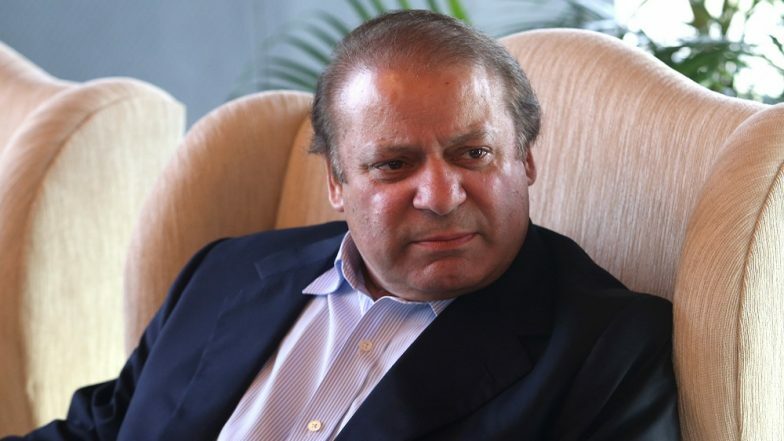 Citing medical reports, the defence counsel Khawaja Haris claimed that Sharif is taking 17 different medications, reported Tribune.During the hearing of the petition, Chief Justice Khosa said: "We know that Nawaz receives medical care in London. We want to know whether his health has deteriorated in the prison." Justice Khosa also directed Khawaja Haris to read reports from the imprisonment date in order to deliberate whether the apex court could intervene or not. Ex-Pakistan PM Nawaz Sharif Moved to Kot Lakhpat Jail for 7 Years in Al-Azizia Case, Acquitted in Flagship Reference. Earlier in March, Sharif had moved the Supreme Court against a decision by the Islamabad High Court, rejecting his bail application in connection with Al-Azizia reference case. Sharif's counsel filed a plea in the top court, stating that the high court's decision should be declared null and void. However, the Islamabad High Court rejected Sharif's petition seeking bail on medical grounds. The High Court bench comprising Justice Aamer Farooq and Justice Mohsin Akhtar Kayani ordered that the bail could not be given on medical grounds. After complaining about high fever, headache, and severe body pain, Sharif was shifted to Jinnah Hospital from Kot Lakhpat Jail in Lahore last month. On December 24 last year, Sharif was sentenced to seven years in prison by an accountability court in Al-Azizia reference case and was fined the US $ 2.5 million.